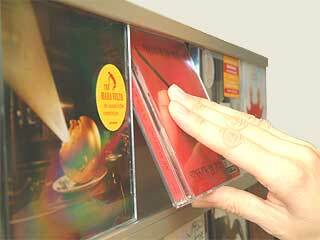 If you want to insert a different disc in your CD player swiftly, one grasp suffices, and you’ve got the CD you want in your hand; you needn’t even move the adjacent CDs. You’ve always got access to your favourite CD without lengthy search: Simply press on the CD you want – it turns forward straight away, and you can take it. Just put the CD in, press softly at the lower part, let got – and clack! Because of the intelligently shaped profile of the SIGMARAIL® rails, the CD slides into its resting position by itself and fits perfectly – without any annoying re-arrangements. The SIGMARAIL® tilting function is thus clever, innovative, and singular, it has got a copyright by the German Patent Office.